Emmet: Yeah, well, you make that sound easy. Nick: Well sure, it is easy. You just gotta do the kind of work that you wanna do and stand by it. With credits that include This is Spinal Tap, Waiting For Guffman, and Best in Show, writer/director/actor Christopher Guest is undoubtedly a master of satire. While the aforementioned films are all masterful works of lampoonery, Guest's first directorial effort, The Big Picture, is a bit of an enigma. The story, conceived by Guest and producer/screenwriter Michael Varhol, shows a na�ve young filmmaker trapped within the conspiring treachery of the Hollywood moviemaking business. I was immediately intrigued with the idea of a film that parodies the scheming nature of the very industry in which it was created. It is the perfect subject matter for motion picture mockery, but it eventually falls into its own trap. Ironically, halfway through, I found myself wondering if The Big Picture had not also become a victim to the manipulations of the Hollywood system. As the film opens, hopeful director, Nick Chapman (Kevin Bacon), is nervously awaiting the announcement of the winner at the Student Film Awards. Nick's short film, while intentionally made to look sophomoric, is clearly the best amongst the other films, which are both repugnant and hysterical in their pompous unconventionality. After Chapman's film wins, he is approached by the renowned Hollywood producer, Allen Habel (J.T. Walsh), whose first remark is "Brilliant. Absolutely brilliant." This is Chapman's first shot at a Hollywood picture, but he gets more than he bargained for when he finds himself sacrificing his morality and artistic integrity amongst the Hollywood big shots. There are wonderful comedic moments here, particularly during the first act. Martin Short's portrayal of a Hollywood agent is so satirically accurate that it is nearly frightening. The methods by which the producers of Chapman's film insist it be modified are both hilarious and sobering in their realism. When Chapman reveals the intention to shoot his film in black & white, Habel responds by asking him, "If you shoot it in black & white they're just going to colorize it anyway, so what's the point?" Yet another producer even goes so far as to tell Nick that modern cinemas do not carry black & white projectors! It is also great fun to see the film imitate classic motion pictures, such as It's a Wonderful Life. This recreation leads to one of the film's heartiest laughs. 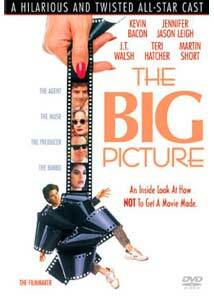 For all of its strong suits, The Big Picture eventually becomes as muddled as Chapman's potential film. When Nick's vision falls apart, so does The Big Picture, as the story takes off in several unusual directions. The clich�d fantasy sequences, slapstick humor, and overt metaphors are just a few methods that ironically seem as if they were thrown in at the insistence of a producer who hoped their inclusion would help to connect with a wider audience. I cannot help but wonder if The Big Picture began as an entirely different idea, only to be chewed up and spat out by the merciless Hollywood motion picture industry. Or perhaps, Guest and Varhol saw this concept as a unique opportunity to create the ultimate satire, the entire film being a subtle metaphor as to what happens when integrity is compromised for fame. Yet, to believe that it was the filmmakers' intentions to sabotage a project in order to give it satirical depth is giving them and their film far too much credit. At the end of The Big Picture, Nick Chapman is redeemed, but the film is far beyond the point of redemption. What we are left with is a horrible irony rather than a noble satire. Image Transfer Review: While The Big Picture shows signs of age, the anamorphic image transfer is quite impressive. The film is presented in 1.85:1, though the short student films appear in varying aspect ratios, from 1.85:1, to 2.35:1, to 1:66:1. The overall presentation is smooth and film like, yet there are times where the print appears fuzzy and lacks sharpness. Video deficiencies are minimal, but aliasing occasionally proves quite bothersome. Colors appear vibrant and natural, while hues waver a bit in darker scenes. Black level is decent, but not quite as dark as one could hope for. Though there are problems with the particulars, the big picture is incredibly pleasing and free from distraction. Also included is a 1.33:1 pan & scan version, which could be referred to as "The Small Picture." Audio Transfer Review: I cannot remember the last time I heard such a bold Dolby Surround 2.0 Soundtrack. Surround presence is remarkably strong; while obviously not stereo, the rear channels possess a sense of aggression often heard on a 5.1 track. Bass is equally impressive with a deep and clean presence during the musical numbers. Dialogue is consistently clean and clear with no signs of distortion. While the dynamic range might not be as impressive as that of a 5.1 soundtrack, the 2.0 surround track certainly exceeded my expectations. Extras Review: Though The Big Picture was a likely candidate for a bare bones release, Christopher Guest and company have taken the time to provide viewers with several insightful extras. Quite impressive is a copy of the original theatrical press kit, included on the cover insert. This is entertaining and recommended reading material prior to watching the film. The first special feature is the commentary track from Christopher Guest and Kevin Bacon. I was surprised to find Guest sound so drab and uninterested throughout much of this track. While both Bacon and Guest offer a few laughs and provide information on the film, overall, this is a dreary commentary. Also included are three deleted scenes, presented full frame. From what I can tell, these are welcome edits, yet the film is so ambiguous that I honestly cannot say what would or would not make it better. The theatrical trailer is presented full frame with stereo sound. It is an uninspiring trailer that does not make The Big Picture seem very appealing. If I had viewed this trailer before watching the film, I would not have been as excited to see it. Also included are trailers for America's Sweethearts, Mr. Deeds, and The Sweetest Thing, all of which are anamorphic widescreen with 5.1 sound. Finishing up the brief collection of extras are cast and crew filmographies, erroneously listed as "filmographics" on the back of the case. The tagline of The Big Picture states that this is "An inside look at how NOT to get a movie made." However, it might read more appropriately as "An inside look at how NOT to make a movie." Whether the film is merely a jumbled series of events or a bizarre Andy Kaufman-like gag, it fails to provide the entertainment one would hope for from such a talented team of filmmakers.